Arles Merino is one of worlds 20 merino sheep breeds. 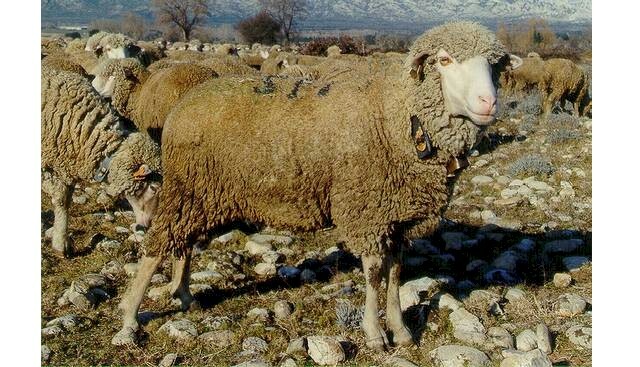 They were developed in the South of France, by using local merino, Spanish merino (Est a Laine Merinos) and Australian Booroola sheep. The sheep were first selected by the greatest amount of wool and fine wool. However, currently the primary breeding goal is milk production of ewes and the rapid growth of lambs. In addition, those specimens are preferred for breeding who make the breed less dependent on the season, which means that the goal is to ensure good fertility all year round. They have a muscular rump and fine wool. Their wool is white with a fiber diameter of approximately 20 micron (min 17 micron, max 26 micron) and a length of 60 to 70mm. Wool from the ewes weights around 3kg and the rams wool weighs 5,5kg. The ewes weigh 40 to 60 kg, rams 70-90 kg. Fertility quotient is 1.2 lambs per ewe.